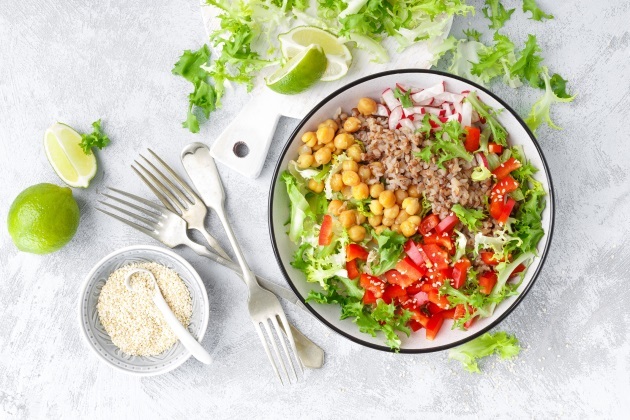 Trend spotters are projecting that the "pegan" diet will become popular in 2019. A combination of paleo and vegan diets, searches for the pegan diet rose 337 percent on Pinterest in recent months. People looking to inculcate healthier eating habits may opt for this diet that promotes gut health. The term was introduced by Dr. Mark Hyman, director of the Cleveland Clinic Center for Functional Medicine and a New York Times best-selling author, when he detailed his own diet, a mashup of paleo and vegan diets. The combination works because both diets focus on eating fresh and organic produce. A vegan diet is devoid of all animal products or byproducts, like eggs, meat, cheese, yogurt or even gelatin. A paleo diet tries to follow the diet patterns of Paleolithic-era humans. So, dieters eat unprocessed foods consisting of fruits, vegetables, nuts, fish and grass-fed meats like they did 2.5 million years ago. While there are some differences between the two diets, both advocate eating whole foods and plants. One of the key reasons for the rising popularity of the pegan diet is that it allows dieters to eat meat and fish sparingly. While most of the diet, 75 percent, consists of plant-based food, it balances out the cravings for meats. A strict, meat-free diet is not always a feasible solution for many, but with the pegan diet, they can continue eating healthy. Eating grass-fed and sustainably raised meat and controlling portions will help. Hyman suggests an easy way to do this — eat meat as a side dish, not the main course. Those who find it hard to give up dairy products can opt for sheep- or goat-based dairy products, which are easier to digest. Dieters should also focus on healthy fats like those found in avocados, nuts, coconut oil and saturated fats from organic meat products. Sugar needs to be avoided as much as possible. With millennials looking to eat in and focus on home cooking, healthy eating is no longer a fad but a way of life. The typical American meat and potatoes diet has led to a slew of health problems for many and people have woken up to its dangers. Eating the pegan way is a great way to transition into a healthier lifestyle. It helps to lose weight and sustain that loss, improve skin health, energy and overall health. Detractors, however, call it too restrictive, which might not be healthy for the mind or the body. Many have been left feeling too hungry, lacking in energy and even suffering from low blood pressure and headaches. It works better for paleo dieters and not so much for the vegans who can't eat meat. Since the diet does not include legumes, where many vegans get their proteins from, their food intake remains incomplete. Experts such as these feel that the pegan diet may work better when people are transitioning to a healthier, plant-based lifestyle but should not be continued long term.